KEYSTONE Colorado faces daunting challenges in providing a healthy environment for both its oldest and youngest citizens, according to a new report from the Colorado Health Institute. The report, Reaching Our Peak: Creating a Healthier Colorado, assesses how Colorado rates in five major areas that affect health: schools, workplaces, communities, medical providers and places where we age. The Colorado Health Institute unveiled the report at this weeks Colorado Health Symposium, a gathering of state and national health leaders sponsored by the Colorado Health Foundation. Colorado scores lowest for healthy aging, according to the reports authors who warn that a senior tsunami will wash ashore in the coming decades. Colorados fastest-growing age group is 65 and older. By 2030, the older population is expected to be three times larger than it was in 2000, increasing from nearly 420,000 to more than 1.3 million. Many of these seniors will require long-term care and support, either at home or in an institution. On aging, were low. This trend (of a growing number of seniors) has just started, said Sara Schmitt, lead author for the report and director of community health policy for CHI. Because long-term care is so expensive, less-costly alternatives are critical. New trends include Green House Homes where residents have some private space but share meals and have skilled nursing care. Colorado is just beginning to explore this newer concept for aging with assistance, the report finds. The study authors also analyze another new trend known as Naturally Occurring Retirement Communities or NORCs. These are condo complexes, apartment buildings, neighborhoods or communities where a significant number of older people happen to live. Colorado has just one official NORC, a neighborhood in Edgewater. Many seniors want to age in place, and the study authors find theres good evidence that it makes sense to provide greater support for retirees where they already live. 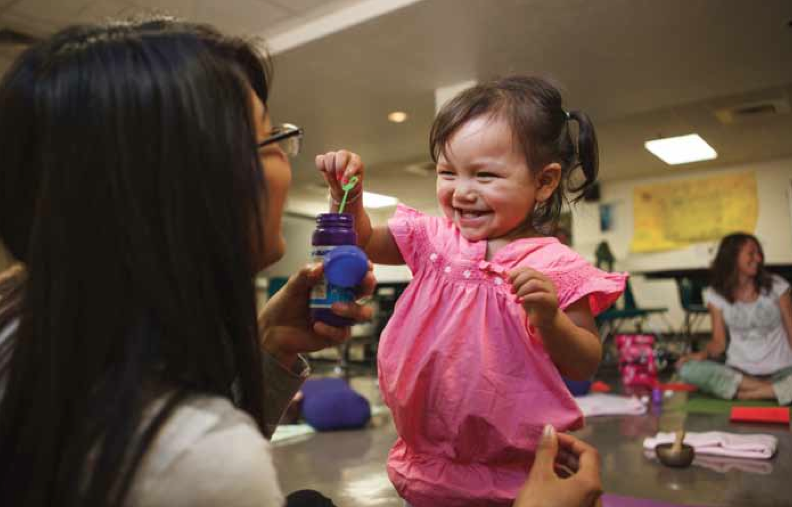 A toddler and her teenage mother play with bubbles during the Mommy & Me yoga class at Florence Crittenton High School. The class is put on by The Wellness Initiative, which offers programs that help students in lower-income schools and districts. Photo by Brian Clark Colorado Health Institute. Colorado has a five-year $22 million federal grant called Colorado Choice Transitions. It aims to move about 500 Medicaid clients out of nursing homes and into community-based housing, but that program has not yet gained traction. When it comes to children, Colorado gets middling scores, according to the report. New data from the U.S. Centers for Disease Control and Prevention find that Colorado is just one of three states where child obesity rates are climbing while they are beginning to fall elsewhere in the country. While the Colorado Health Institute report does not track child obesity rates specifically, the authors did look at physical activity requirements in schools. National guidelines call for 60 minutes or more per day of physical activity for young people. Hunger can also be a great obstacle to learning and unhealthy eating can lead to obesity. The report finds that nearly 249,000 Colorado children 20 percent of the states young population live in homes where caretakers cant put enough food on the table. Almost 75 percent of Colorado children who qualified for free- or reduced-price meals did not eat breakfast at school, primarily because breakfast was served too early. Colorado has a new law that will go into effect in the 2014-15 school year that requires schools with high percentages of low-income students to serve breakfast after the bell. The report also finds extensive evidence that prenatal care and early childhood education result in much healthier outcomes for children. What we know is that a lot of what happens early in life early childhood education and prenatal care helps you start at a certain place. There are some very important things that can happen early in life, Schmitt said. The report aims to be a playbook for policymakers and lawmakers to trigger ideas about whats working, what trends Colorado might want to import from other states and possible measures to consider for future legislation. Its about sparking ideas. We didnt pick (programs) that we know are home runs. Some are new, but theyre certainly in the dialogue, Schmitt said. A controversial proposal that is gaining traction elsewhere but may not fly in Colorado is higher taxes on soda and other sugar-sweetened beverages. Sugary beverages account for 46 percent of all added sugar consumption in the average American diet, the report finds. Colorado applies a 2.9 percent sales tax on soda, but not on other sugary beverages. Thats far below the rest of the country where average taxes are about 5 percent. Some studies estimate that increasing the price of sugary beverages can drive down consumption. The anti-smoking movement may hold lessons for sugary drink consumption, the report says. Governments have taken multiple approaches to curb tobacco use including funding smoking-cessation treatments, limiting advertising, education campaigns as well as heavily taxing products. Were doing well in some areas. We also have a lot of opportunities to try things out, Lueck said. Weve done some HIAs. Wouldnt it be great if there were an HIA with every economic assessment?